Temple students and faculty join forces with Tree House Books to make a difference. Not too far from Temple lies a small bookstore that makes a large impact within the North Philadelphia community. In an effort that began five years ago to revitalize a once-booming Susquehanna Avenue, the idea for a used bookstore was created, and Tree House Books was born. 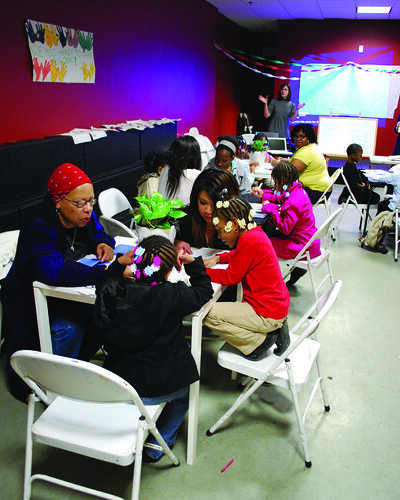 While it is known to sell African-American and children’s books, Tree House also produces a biannual community magazine titled The Ave.
Children receive tutoring at Tree House Books but often choose to stay for the magazine workshop (Carroll Moore/TTN). Every week, community members of all ages come together to attend workshops where they write their contributions to The Ave. The magazine is named The Ave because of the bookstore’s location on Susquehanna Avenue. It is distributed free of charge throughout the neighborhood. Darren Brown, 13, has been working with Tree House for several years. He said the magazine is an important aspect of the community. “You can see the hidden talents of the neighborhood kids, and if the people are feeling something, they can express it in art,” Brown said. Tree House Books is a nonprofit organization that offers services including tutoring, junior staff member and summer programs. Youth who attend Tree House Books do a lot of “thinking” while engaging in chess, music, gardening and most recently, theater art. The bookstore’s playhouse area is used to show movies and present open mic performances. Temple theater students have practiced in the playhouse for their productions. Stephanie Cryor, a sophomore theater major, volunteers twice a week at the bookstore, helping youth with homework and playing theater games with them. Cryor appreciates Tree House’s desire to promote creativity in the community. She plans to help some of the junior staff members create their own works to perform at Tree House Books. Core volunteer staff member Star Bocasan said Tree House is unique because of all the different people who work and attend the bookstore. In addition to adult volunteers, there are at least seven junior staff members who also lend their hands to the efforts of Tree House after school and on the weekends. On Saturdays, the bookstore can see as many as 30 locals in attendance at workshops. Sebright describes the junior staff members as voices for peers and younger kids. Nyseem Smith, 14, is a local junior staff member who assists in tutoring children, maintaining the store and contributing to The Ave. However, Smith claims that his favorite aspect of working at the bookstore is taking on the role of a mentor. To become a junior staff member, students must successfully complete an application and interview process. Junior staff members help out during the week. Dr. Eli Goldblatt, an English professor at Temple, also works with Tree House Books through New City Writing: Institute for the Study of Literature, Literacy and Culture, a program that develops connections between the Temple writing program and neighborhood centers and projects. Sebright and Goldblatt would like for Tree House Books to be able to provide more programs for adults that are relevant to the concerns of the community. Last year, in the aftermath Sgt. Patrick McDonald’s murder at 17th and Colorado streets, just a few blocks away from Tree House Books, the store held a program that brought residents from the community together to discuss the violence in the area. Program Coordinator Michael Reid said by working with the materials that they have and creating something good, the bookstore is a metaphor for life. A short walk from Main Campus, Tree House Books presents students with new opportunities.